The capital of the prefecture of the same name, Okayama (pop. 621,000) is not a major sightseeing destination. It is worth stopping there if you are passing by, however, as it boasts one of Japan's three finest garden, Kōraku-en, not to be confused with its Tokyo homonym (which is nevertheless worth seeing). 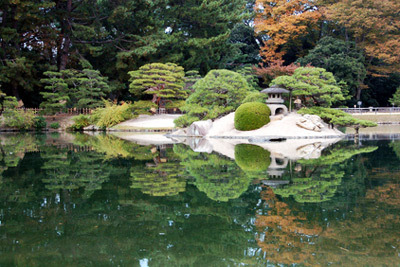 Kōraku-en Garden was laid between 1687 and 1700. Its name means "taking pleasure later", from the Chinese proverb that "the lord must bear sorrow before his people, and take pleasure after them". The garden is noted for its vast expanse of lawn, borrowed scenery of Okayama castle, No stage, as well as a rice paddy and a small tea plantation. 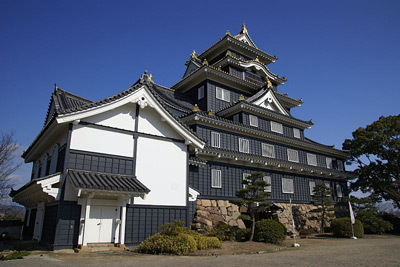 The city's other notable attraction is Okayama Castle. It received the name U-jo (烏城, "Crow Castle") owing to its dark colour, and in contrast to Himeji Castle, 50 km from there, which is dubbed the White Egret. Like many other castles, Okayama Castle was bombed to the ground during WWII, and the present structure is a ferro-concrete reconstruction of 1966. One of the most interesting town in the region is the feudal "warehouse town" of Kurashiki, just 15min by train from Okayama station on the San-yo line. The Kibi plain surrounding Okayama and Kurashiki has a number of interesting places. Bizen is renowned for its Kamakura period unglazed pottery ("Bizen-yaki") used for the tea ceremony. The Washu-zan Hill, due south of Kurashiki, is a popular viewpoint to contemplate the 12km long Seto-ohashi Bridge joining the islands of Honshu and Shikoku. 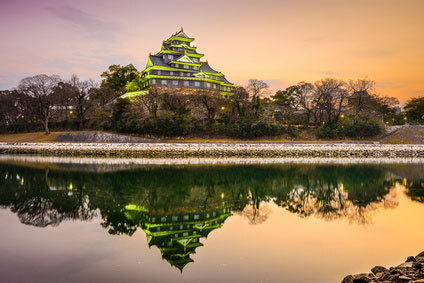 Okayama is one of the gateway to Shikoku and is easily reachable from Osaka (50min, ￥2,940) or Hiroshima (45min, ￥2,940). Other close destinations include Himeji (20min, ￥1,450) adn Takamatsu (55min, ￥1,470). Shinkansen to Tokyo (￥10,190) take 3h30min. Okayama airport is 35min bys bus from the city centre (￥680). JAL and ANA both have flights to Tokyo (Haneda). ANA also flies to Sapporo (Chitose), while JAL flies to Sendai, Kagoshima, and Okinawa.